Matthew Apgar - mapgar@shawmedia.com Jacobs seniors Rebecca Littlefield (left) and Harmony Poweziak practice their performance of the song "Fabulous" from High School Musical 2 in the hallway before their audition for the 24-hour musical at Jacobs High School on Thursday, March 1, 2018 in Algonquin. Students have no idea what musical they are auditioning for, but will have 24 hours to learn their parts before performing on Saturday, March 10. Proceeds from the show benefit Lurie Children's Hospital. 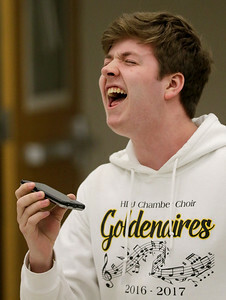 Matthew Apgar - mapgar@shawmedia.com Jacobs senior Ethan Eckhaus belts out vocals to the song "Moving Too Fast" from the musical "The Last Five Years" playing on his phone during auditions for the 24-hour musical at Jacobs High School on Thursday, March 1, 2018 in Algonquin. Students have no idea what musical they are auditioning for, but will have 24 hours to learn their parts before performing on Saturday, March 10. Proceeds from the show benefit Lurie Children's Hospital. 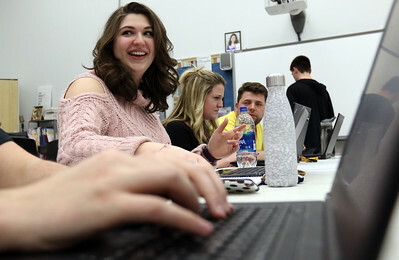 Matthew Apgar - mapgar@shawmedia.com Jacobs High School senior Holly Bender smiles as she sits with (from left:) Math teacher Adam Stromberg, social worker Kirsten Zehrer, and English teacher David McGill as they listen to students audition for the 24-hour musical at Jacobs High School on Thursday, March 1, 2018 in Algonquin. Students have no idea what musical they are auditioning for, but will have 24 hours to learn their parts before performing on Saturday, March 10. Proceeds from the show benefit Lurie Children's Hospital, where Bender's brother was a patient. 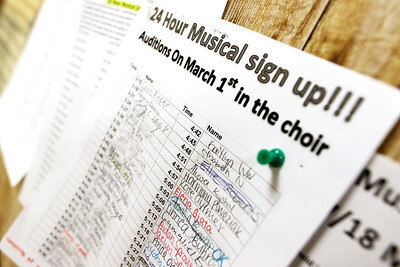 Matthew Apgar - mapgar@shawmedia.com A sign-up sheet pinned to the wall shows a filled list of times for auditions for the 24-hour musical at Jacobs High School on Thursday, March 1, 2018 in Algonquin. Students have no idea what musical they are auditioning for, but will have 24 hours to learn their parts before performing on Saturday, March 10. Proceeds from the show benefit Lurie Children's Hospital. Matthew Apgar - mapgar@shawmedia.com Students, including seniors Harmony Poweziak (left) and Rebecca Littlefield (right), cheer from behind closed doors as they listen to senior Lorenz Sapanhila finish his performance of the song "Ripped Pants" from Spongebob during auditions for the 24-hour musical at Jacobs High School on Thursday, March 1, 2018 in Algonquin. Students have no idea what musical they are auditioning for, but will have 24 hours to learn their parts before performing on Saturday, March 10. Proceeds from the show benefit Lurie Children's Hospital. Matthew Apgar - mapgar@shawmedia.com Senior Lorenz Sapanhila (right) laughs with friends after finishing his performance of the song "Ripped Pants" from Spongebob during auditions for the 24-hour musical at Jacobs High School on Thursday, March 1, 2018 in Algonquin. Students have no idea what musical they are auditioning for, but will have 24 hours to learn their parts before performing on Saturday, March 10. Proceeds from the show benefit Lurie Children's Hospital. 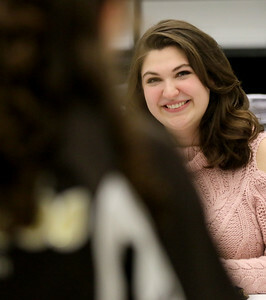 Matthew Apgar - mapgar@shawmedia.com Jacobs High School senior Holly Bender smiles as she listens to students auditioning for the 24-hour musical at Jacobs High School on Thursday, March 1, 2018 in Algonquin. Students have no idea what musical they are auditioning for, but will have 24 hours to learn their parts before performing on Saturday, March 10. Proceeds from the show benefit Lurie Children's Hospital, where Bender's brother was a patient. 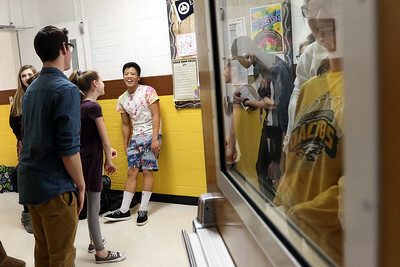 Matthew Apgar - mapgar@shawmedia.com Students gather around the doorway to listen to senior Lorenz Sapanhila perform the song "Ripped Pants" from Spongebob during auditions for the 24-hour musical at Jacobs High School on Thursday, March 1, 2018 in Algonquin. Students have no idea what musical they are auditioning for, but will have 24 hours to learn their parts before performing on Saturday, March 10. Proceeds from the show benefit Lurie Children's Hospital. 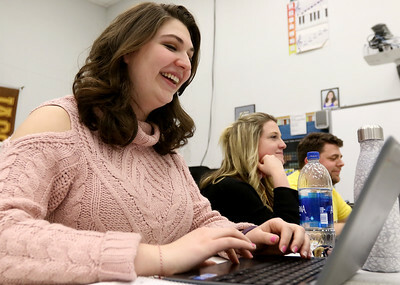 Matthew Apgar - mapgar@shawmedia.com Jacobs High School senior Holly Bender smiles as she takes notes on a laptop while students audition for the 24-hour musical at Jacobs High School on Thursday, March 1, 2018 in Algonquin. Students have no idea what musical they are auditioning for, but will have 24 hours to learn their parts before performing on Saturday, March 10. Proceeds from the show benefit Lurie Children's Hospital, where Bender's brother was a patient. 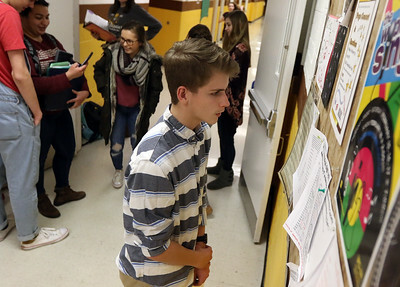 Matthew Apgar - mapgar@shawmedia.com Freshman John Kaiser checks the sign-up sheet for his audition time for the 24-hour musical at Jacobs High School on Thursday, March 1, 2018 in Algonquin. Students have no idea what musical they are auditioning for, but will have 24 hours to learn their parts before performing on Saturday, March 10. Proceeds from the show benefit Lurie Children's Hospital. 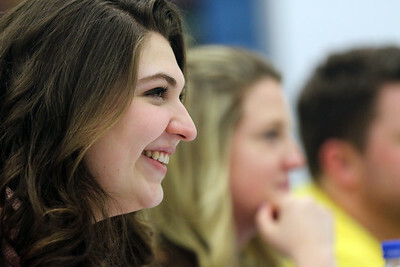 Matthew Apgar - mapgar@shawmedia.com Jacobs High School senior Holly Bender smiles as she listens to junior Kailey Connors perform "Part of Your World" from The Little Mermaid duing an audition for the 24-hour musical at Jacobs High School on Thursday, March 1, 2018 in Algonquin. Students have no idea what musical they are auditioning for, but will have 24 hours to learn their parts before performing on Saturday, March 10. Proceeds from the show benefit Lurie Children's Hospital, where Bender's brother was a patient. Matthew Apgar - mapgar@shawmedia.com Senior Lorenz Sapanhila (center) laughs with friends after finishing his performance of the song "Ripped Pants" from Spongebob during auditions for the 24-hour musical at Jacobs High School on Thursday, March 1, 2018 in Algonquin. Students have no idea what musical they are auditioning for, but will have 24 hours to learn their parts before performing on Saturday, March 10. Proceeds from the show benefit Lurie Children's Hospital. Jacobs High School senior Holly Bender smiles as she listens to junior Kailey Connors perform "Part of Your World" from The Little Mermaid duing an audition for the 24-hour musical at Jacobs High School on Thursday, March 1, 2018 in Algonquin. Students have no idea what musical they are auditioning for, but will have 24 hours to learn their parts before performing on Saturday, March 10. Proceeds from the show benefit Lurie Children's Hospital, where Bender's brother was a patient.